A sluggish economic climate, low wholesale prices and less consumer demand all spell trouble for Christmas tree farms across Oregon. In 2008, 7.34 million trees were sold in Oregon, propelling a $110 billion industry and the No. 1 producer of Christmas trees in the U.S. That number is expected to shrink to 5 million by next year as many farmers have abandoned the business due to a challenging market and surplus of trees. In early 2000 many farmers were lured by the high prices of trees and gave up on other crops to invest in Christmas trees. It takes 5-10 years for trees to mature for sale and many trees that were planted during the boom are now up against the frugal consumer and Oregon’s recession. Simply put, there are just too many trees and not enough demand. High supply and low demand are forcing some farmers to sell their trees for less than it cost to produce them. 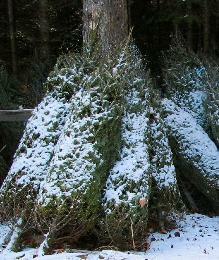 This will likely mean lower prices for Christmas trees this year. For the farmers, it means they may have to cut and burn trees. According to the National Christmas Tree Association (NCTA), consumers in 2008 bought 10% less Christmas trees than in 2007. Add in the sluggish economy, where consumers are opting to buy one tree, rather than multiple, or perhaps even a smaller, less expensive tree and many farmers are getting concerned. The growing popularity of artificial trees has encouraged the Pacific Northwest Christmas Tree Association’s recent marketing campaign, urging consumers to go back to buying a real, authentic tree. Last year, the average amount consumers spent on a tree was $36.60, compared to $60.63, the average cost of an artificial tree. The good news is that NCTA expects that 35% of the people they polled will buy a real tree, a fact that they find promising for the coming holiday season.